In 2007, Melissa Atkins and Anthony Oliver decided to combine their artistic energy and practical talent to create an innovative business that connects people to Kentucky’s waterways and reunites them with the natural world. 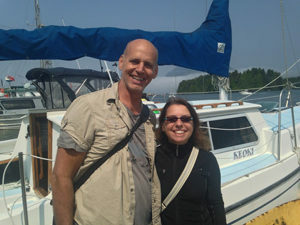 “When someone builds a boat, it’s an assertion that they still believe in the extraordinary potential of the present,” says Meliss and Anthony. Skipping Fish Boat School is taking the kayaking experience to the next level. In fact, the name of their business “Skipping Fish” was inspired by a kayak trip on the Ohio River. Melissa and her friend were on a sunrise paddle and noticed there were little silver fish jumping and swimming all around them. There were so many of them that morning that the water appeared to be alive.Melissa and her fellow paddler playfully named them “Silver Skipping fish.” Melissa later found out they weren’t too far off the mark…their dancing, silver friends were the Ohio River’s Skipjack fish. Skipping Fish Boat School has an appealing range of programs for adults and youths ages 13-18 years old. Adult classes are offered throughout the year and a variety of summer camps are offered to youths. Melissa and Anthony commented that last year’s summer camp was a great success and that they felt privileged and excited to be instrumental in teaching young people a new skill that will empower them and ultimately get them outside and on the water. Dennis Pidgeon grew up listening to stories about boats, weather and water. The Pidgeon men were longstanding navigational captains on the Great Lakes and the St. Lawrence Seaway. Dennis’s love of flyfishing and the pursuit of newer and more remote places to fish prompted him to build his first kayak. He has been building boats for 20 years now. 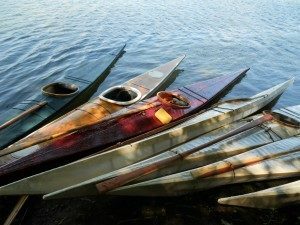 He has paddled extensively on both the Atlantic and the Pacific coasts, the Great Lakes, throughout the Pacific Northwest and the Northwest Territories.. He is a historian and he has an extensive knowledge of Ohio River history. Melissa Atkins is the granddaughter of Jane Elizabeth Hudson of the Allegheny River Hudsons, who owned and operated the packet boats of the Allegheny River. 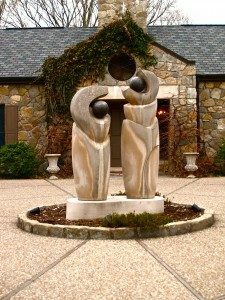 Melissa graduated from the School of the Art Institute of Chicago and has worked as a professional sculptor, working in stone and bronze. Her work is in numerous collections internationally, but she is probably best known for the 19 ton baseball glove carved out of a 30 ton piece of Kentucky limestone that resides permanently in the Louisville Slugger Museum in Louisville, Kentucky. Melissa was first introduced to paddling by a friend who took her out paddling on the Ohio River in 2004. In one powerful instant she knew that she needed to get her own kayak.